Back to a Bleak Future for Outdoor Ed? Today is Back to the Future Day. For those who did not spend their teenage years in the early 1980’s; this means that it is the date that main characters Marty and Doc (not of Snow White fame) travel to in the second film in the series. I love any story about time travel; and firmly believe that a paradox a day keeps the bed bugs away. Imagine then, what we would see on Dartmoor if we could launch ourselves twenty six years into the future. Probably some good and some bad changes; but my saddest prediction is the disappearance of teams of youngsters hiking across the moor. There are those who, for various reasons, do not like to see these youngsters; these naysayers are shortsighted; but they may well end up getting their wish. In twenty six year’s time, if governments and school managers continue with present policies and trends; I fear we will have lost almost all outdoor education. 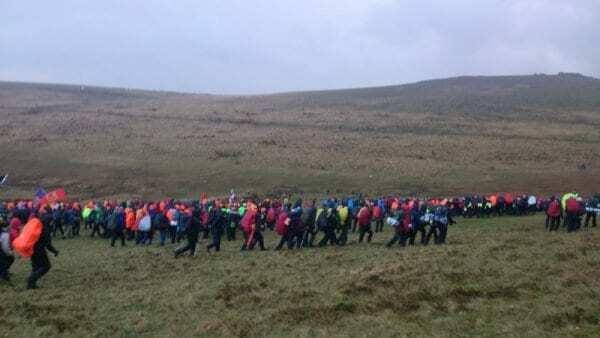 Challenges like Ten Tors and the Duke of Edinburgh’s Award have, in recent years, been downgraded within a political regime in which exam results are the be all and end all of personal endeavour. Schools are being turned into businesses, and gain no recognition for outdoor education. 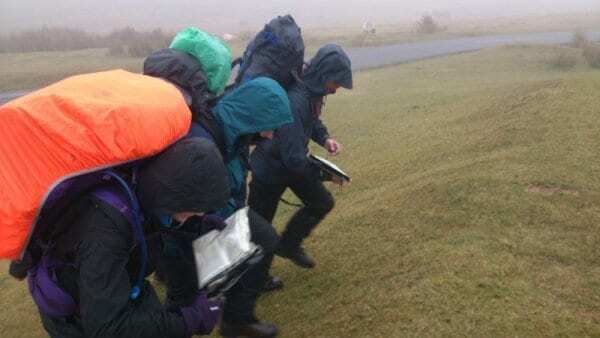 Fewer and fewer school managers care about, let alone understand, the days and nights of voluntary work that go into making expeditions happen. The volunteers have gone past expecting praise, and are now having to steal time to make outdoor education happen at all. I should know, I can see it happening all around me, the undermining isn’t even subtle anymore. So what, I hear you say. Children can grow up without the outdoors; they can’t get jobs without exam results. But you ask Mr Average Employer; a Duke of Edinburgh Award requires a level commitment, teamwork and determination that he would pay his eye teeth to find in his employees; a GCSE in maths does not. So, a Dartmoor without youngsters? That is clearly a Dartmoor without a future. What can you do about it? Well I suggest that you start asking questions; ask schools, ask local government, ask your MP, ask the business community … ask them what they want to see in twenty six year’s time, and who they want to employ! We agree totally with all you have expressed. We talk to a lot of people in Duke of Edinburgh Award groups, schools, scouts and others all involved in outdoor education. All tell the same story. At a time when we need to get our young people outdoors we are watching the system that has successfully achieved this for many years suffer through lack of funding and old fashioned support. Hopefully the message will get through eventually. A lovely memory. My first outdoor ed experience was also at Llanrug! Just marvellous. Do not get me started!! Here’s a typical response from this wonderfully well rounded student that we are developing that I received today while trying to encourage some students to go on a trip to the Eden Project. “Oh, that’ll be so boring”. “Why?? ?” “Phones. We won’t be able to go on our phones all day”. So sad. We are developing a society of youngsters who only care about going in their phones, I pads, tablets, X boxes etc rather than heading outdoors. As for what schools are teaching them- how to sit back and watch teachers turn themselves inside out running around making sure you get your grades while they do relatively little. Yes eventually we get the grades out of them, but are we really creating young people who can think for themselves, use initiative, problem solve or even people who can communicate effectively. No, I think not. Mmmmm, strange, I think Outdoor Ed does all of these. This country is really gonna come a cropper in a few years time. Again, a picture that is sadly very recognisable! A particularly poignant blog, B2, as I struggle to come to terms with being told that the Outdoor Ed I do isn’t on ‘the list’ of important activities for schools. I didn’t even realise there was a ‘list’. Makes you wonder who on earth wrote it! If you walk around any of the West Country county shows you will see Ten Tors/ DofE being placed front and centre of the marketing for private schools. We are are starting to see exposure to not only outdoor education, but also the opportunity for art, sport, music and culture become limited to those who have money and connections. My own ‘bog standard’ comprehensive was able to offer all of that, including studying a classical language. It’s alumni include at least one international sportsman, not forgetting a number of surgeons, scientists and engineers (this was in the dark days of a more unionised teaching profession and LEA control before Academies had the freedom to impose punitive working conditions and follow a curriculum designed to suit a newspaper columnist). I’m sure the same story can be told in many other schools. It is a very sad state of affairs that none of those ‘Outstanding Features’ will relate to outdoor education. I worry that once this generation of volunteers is burnt out, pushed out or just plain worn out of our schools; there won’t be anyone to set the example to the next generation. I did it because someone did it for me, so did my Mum, so did my Granny probably … my sons do it now! A good article but I don’t see it the way that you do. After many years in the Outdoor Education sector i have seen many ‘coming and goings’ as to the importance of using the outdoors, and whilst there has been a dwindling of the traditional O.E. Centre scene, there has been a large uptake in other areas to compensate for this. I personally do not like the rise of the adrenaline fuelled activities which give rise to short term consumerism within our industry but i accept that it is what people want. However recent research and evidence has started to emerge as the Neurological and social benefits of the Outdoors and this will feed through into policy in the near future as we begin to understand the long term benefits both to the individual and to society as a whole when we address issues such as mental well-being. I think that the traditional notion of the outdoor Education that we grew up with might well change for a more urban or city based (place based) approach which will help us to engage with a wider range of the population and that can only be good. Whilst like you I am saddened by the demise of the ‘traditional’ benchmarks such as ‘Ten Tors’ I do not envisage it as the end of the road, but as an opportunity to redevelop our work so as to be in the best position to adapt to the needs of future generations. I have recently been working with the next generation of Outdoor practitioners and can only say that I am confident that we will continue to succeed with them at the forefront. Thank you for sharing your viewpoint and I do hope that your optimism proves me wrong. Both Blondes appear to have raised some of the next generation of outdoor practitioners, so there is hope. But maybe not in our schools, at least not in those schools that represent poorer student populations … there is a requirement from students and parents, but not the underlying support from government or school leaders. Why is it all about “funding”? You just put on your boots and walk or get on your bike and ride. It’s that simple. As soon as you talk about “funding” you become a political football and at the whim of people and organisations who (frankly, my dear) don’t really give a damn. What you are missing here is that many young people aren’t given the opportunity to experience the outdoors; either by their families (who often didn’t have those opportunities themselves), or sadly more recently, by their schools. Outdoor Education is definitely not just about getting outside; it is about building character, learning to cope with difficulty and learning to work as a team. For us, it is about ‘funding’ because the parents of our youngsters can’t afford to pay for external providers (i.e. not teachers). We give our time for free, lend out our own kit and pay for our own accommodation/expenses/training for that reason. You can throw as much money as you like at it but it won’t shift the trend from “activity” to “technology”. It’s a (youth) culture thing. Money is not the answer. Depressing, I know. Bring back the golden years when we were young and life was simple.